Bob Nerem has won some of the top awards and honors in his field, recognitions for his dedication and accomplishments over a long career as a trailblazing bioengineer. But this summer, he’ll receive the kind of honor that will outlast him, when the American Society of Mechanical Engineers (ASME) commits his likeness to bronze. That would be Nerem, founding director of the Petit Institute for Bioengineering and Bioscience at the Georgia Institute of Technology. 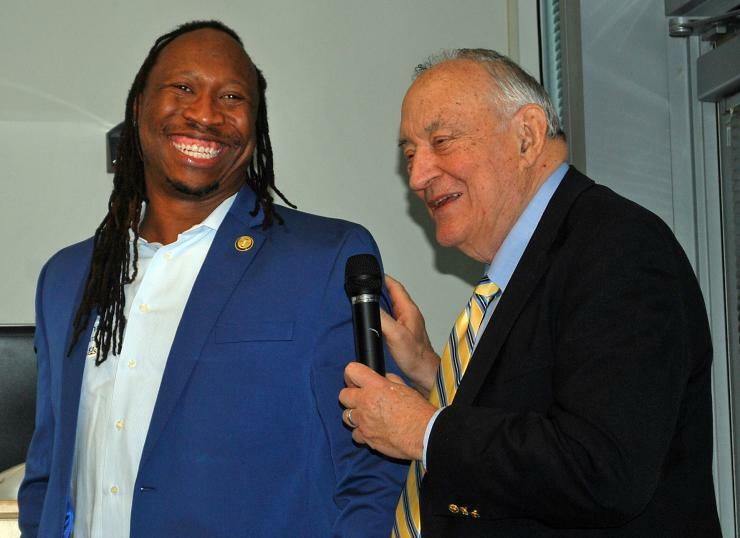 He is a member of the National Academy of Engineers (NAE) and one of only three bioengineers to receive the Founders Award from that organization. He’s also a member of the National Academy of Medicine, and a Fellow of the American Academy of Arts and Sciences. 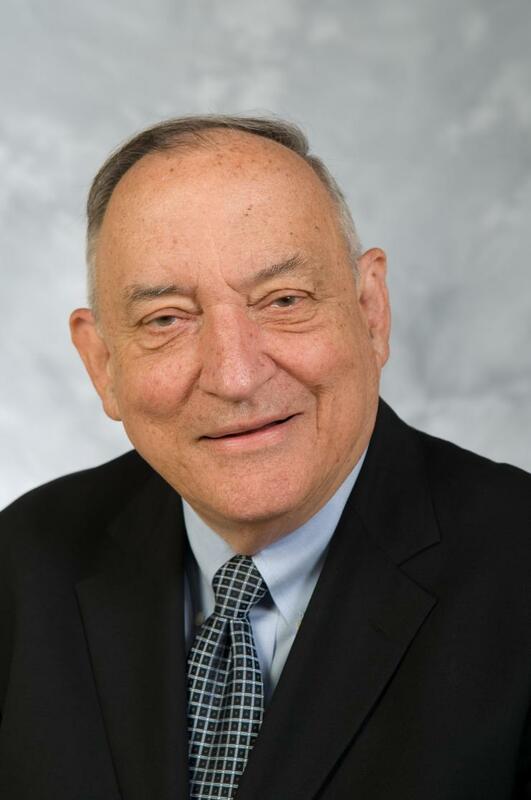 Nerem was instrumental in launching the American Institute for Medical and Biological Engineering (AIMBE), serving as its founding president, and helped establish the National Institute of Biomedical Imaging and Bioengineering (NIBIB), the newest member of the National Institutes of Health (NIH). He also belongs to both the Royal Swedish Academy of Engineering Sciences and the Polish Academy of Sciences, and holds honorary doctorates from the University of Paris, Imperial College of London, and the Illinois Institute of Technology. More significant than any scholarly or research achievement for Nerem has been his commitment to mentorship. He started the Petit Undergraduate Research Scholars program, to help develop the next generation of bioengineering and bioscience researchers with a full-year research experience. In 17 years, the program has supported more than 250 scholars from area colleges and universities, including Agnes Scott, Emory, Georgia State, Georgia Tech, Morehouse, and Spelman. Four years ago saw the beginning of what Nerem considers his crowning achievement – Project ENGAGES. Nerem spearheaded the establishment of this program, which introduces under-represented minority high school students to careers in science and engineering, bringing these young scholars into Petit Institute labs for a year-round research experience. So far, 85 students have participated, and nearly every graduate so far has gone on to college (one chose to serve in the military first). The new Nerem Medal will be granted through ASME’s bioengineering division, says Ross Ethier, interim chair of the Wallace H. Coulter Department of Biomedical Engineering at Georgia Tech and Emory. It’s kind of a big deal, the medal. Establishing it required approval of the bioengineering division leadership (it was unanimous, Ethier says) and also approval of the ASME Board of Governors. “The bottom line is, this medal is really about Bob and honoring his many contributions to the community, his mentorship of junior researchers, and his leadership over the years,” Ethier says. ASME’s newest major award will be launched this summer at the Summer Biomechanics, Bioengineering, and Biotransport Conference (the annual SB3C), June 21-24, in Tucson, Arizona. The well-traveled Nerem, of course, plans to be there. 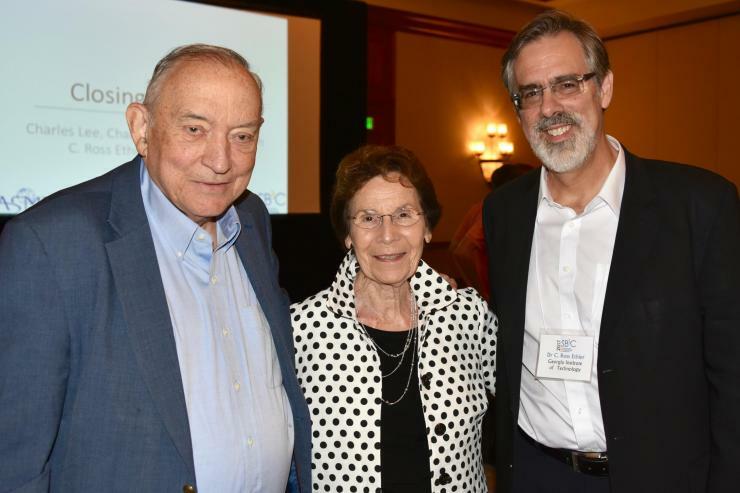 Bob Nerem (right) spearheaded establishment of Project ENGAGES with Manu Platt (left), one of the many young researchers that Nerem has mentored in his career. C. Ross Ethier, friend, colleague, and interim BME chair, presented the ASME medal of honor to Bob Nerem. Nerem's wife, Marilyn, also attended. 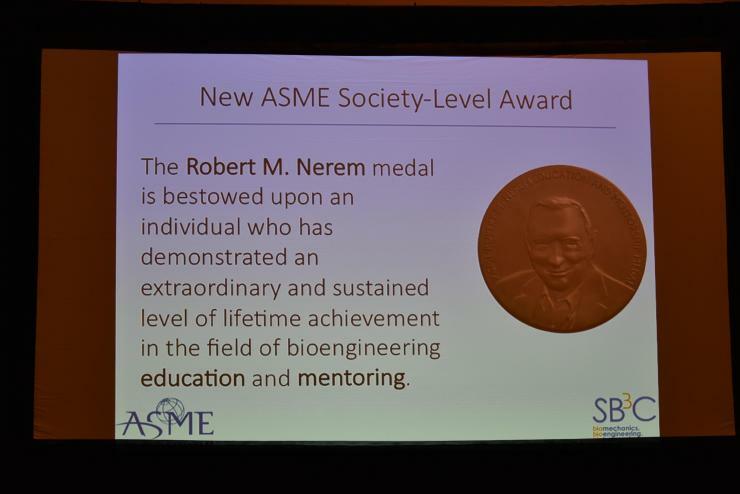 American Society of Mechanical Engineers (ASME) established the Robert M. Nerem Education and Mentorship Medal to recognize Nerem for his role in influencing engineering careers in the growing bioengineering field.